Want your water bill to drop by $114 a year? 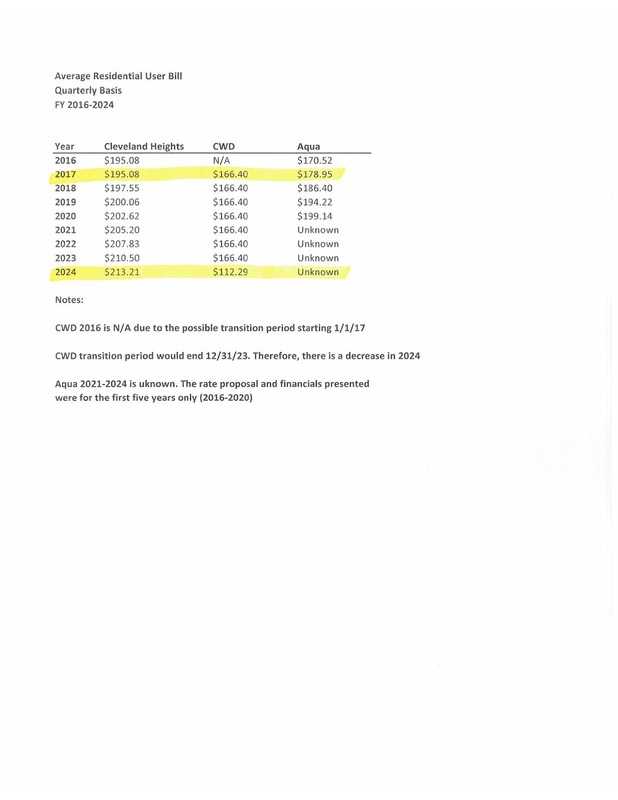 Councilman Jason Stein wants to lower your water bill by regionalizing the Cleveland Heights water system. Do you agree or disagree? At City Council’s Committee meeting on Monday evening, the City Manager and staff presented Council with two choices for the City’s debt ridden water system. Join 52 other Cuyahoga County communities in becoming a Direct Service community of the regional Cleveland Water District (and LOWER the water rate as a result) or raise the water rate (and hope we can fix enough of the systems problems to make it profitable for the City). To view/learn more about these two options, please click on the link below. 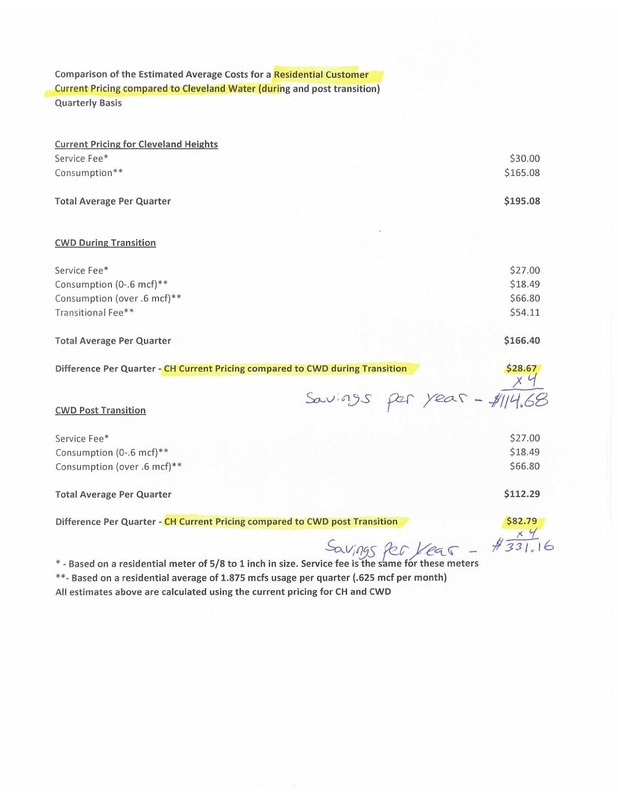 Becoming a Direct Service community will save the average Cleveland Heights residential customer $114.00 yearly during the “transition period” and will then save $331.00 yearly for the post “transition period”. The $114.00 a year savings in our water bill is significant and will benefit seniors, those on a fixed income and everyone that pays a water bill in Cleveland Heights. A very important FACT: Cleveland Water currently provides ALL of Cleveland Heights’ residence and businesses their water. 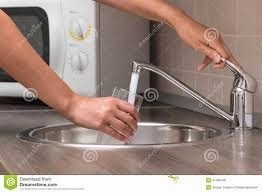 Therefore, the QUALITY of the water will remain the same, as it is the same water supplier (Cleveland Water) and the same pipes that are underground. Additionally, over the next 9 years, the Cleveland Water Department plans to spend $237 million upgrading the regions water mains! 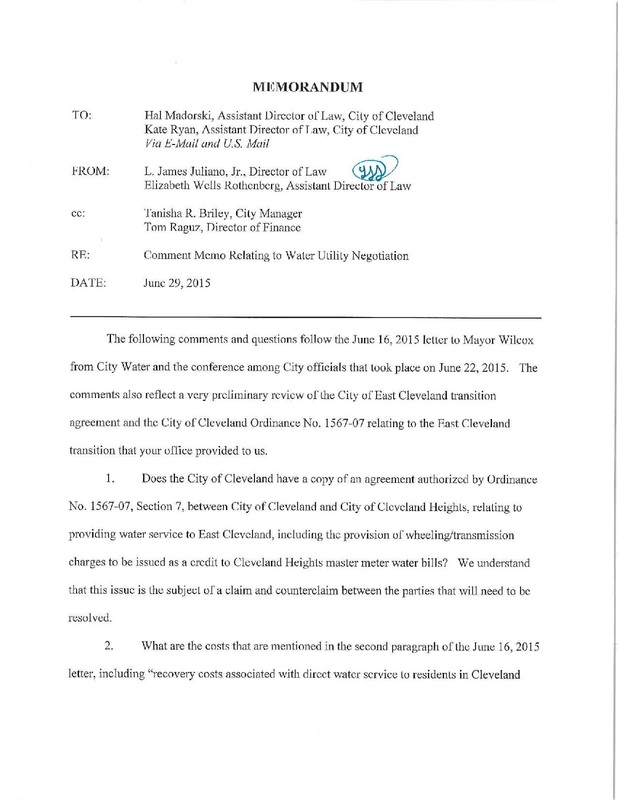 Cleveland Water's direct service proposal (framework) to Cleveland Heights. 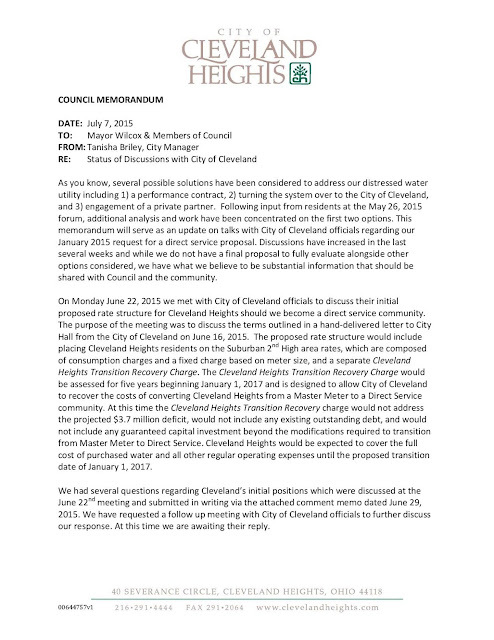 Cleveland Water has submitted a proposed framework to begin direct service with Cleveland Heights. This is a positive first step. But, there are still important questions that will hopefully be answered sooner than later. 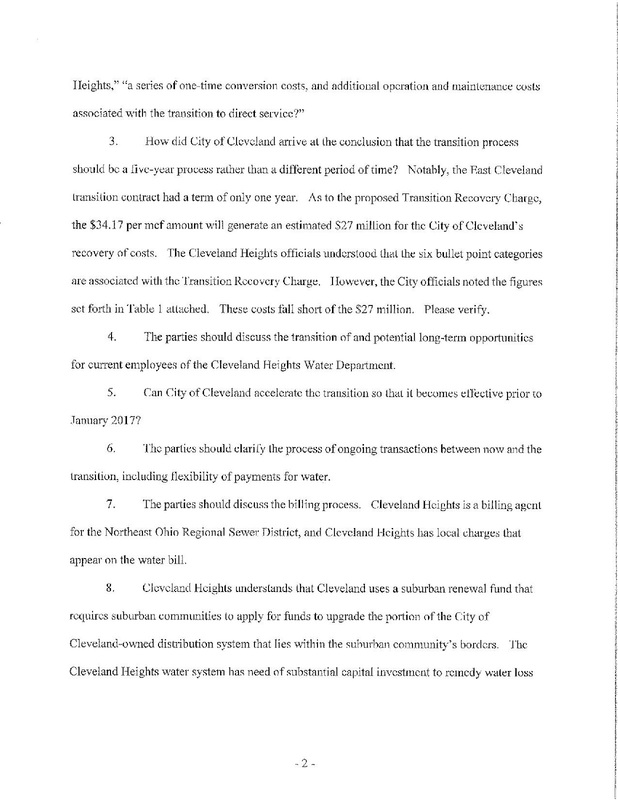 Here is the Memorandum from Cleveland Heights City Manager, Tanisha Briley to City Council. 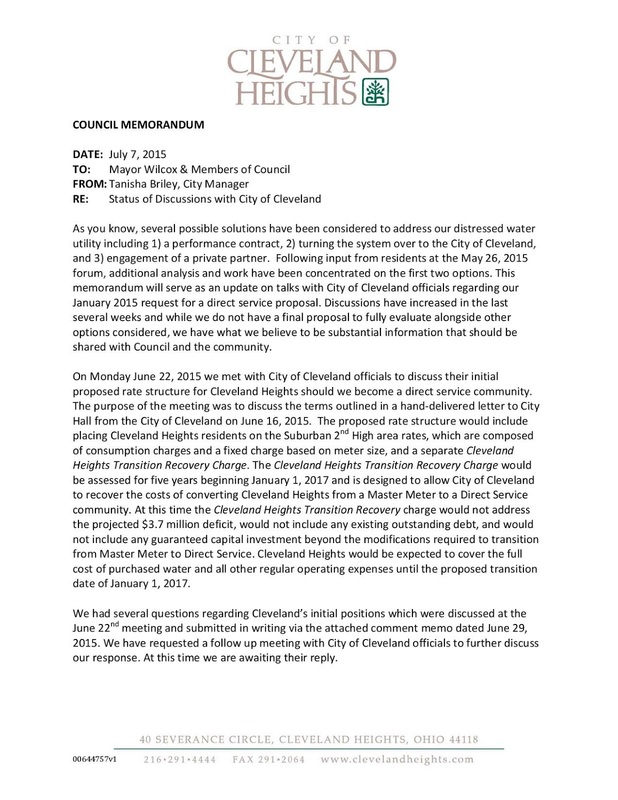 For the last 4 years, I have directly called on 3 different City Managers to begin a discussion with Cleveland Water on a framework for regionalizing the Cleveland Heights water system. I believed then, as is now an established fact, the Cleveland Heights water system is unsustainable and the status quo is not an option any longer. Unfortunately, the majority of Council, at those times in the past, did not agree with my call to initiate those discussions with Cleveland Water. With that said, hindsight is 20/20. Now, with a mounting debt from the massive loss of water in the pipes (water that never reaches residents or businesses) the Council must make a decision on the future of the City’s water lines. It is clear that the City will be unable to maintain control of the water system as the cost is too great and has reached the point that the debt incurred from the water system is greater than the City’s reserves. Of course, this is something that can not wait another year. 1. Almost every other municipality in Cuyahoga County is directly serviced by Cleveland Water. The ONLY municipalities not currently directly served by Cleveland Water are Bedford, Chagrin Falls, Lakewood and of course Cleveland Heights. 2. Cleveland Heights is a “master meter City” (as are Bedford, Chargin Falls and Lakewood). This means that water is sent from Cleveland to Cleveland Heights for a set price (which is only slightly lower than what residence throughout Cuyahoga County pay for their water). Cleveland Heights then charges a premium above that price that the residents pay whenever they turn on their faucets. This “mark up” makes water usage more expensive in a “master meter” community such as Cleveland Heights than our neighbors that are directly served by Cleveland Water. I have always considered this an unnecessary and uninviting expense of living and doing business in Cleveland Heights. 3. Regionalizing our water department will eventually lead to a leveling off of our residential and commercial water rates. Once Cleveland Water completes the necessary $10 million necessary investment into the system and has been reimbursed through higher rates, then a freeze period of the rates would ensue. 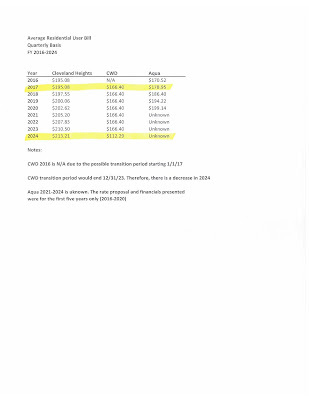 This rate freeze would be in effect over a period of time until the Cleveland Water rate eventually matches the Cleveland Heights rate. I am under the impression that this would take 4-7 years. The end result would be a lower rate for our residents and businesses from the “mark ups” our City currently charges or whatever “mark up” a for-profit company would charge if they were the biller. 4. The City has been diligent in its efforts to keep spending in line with realistic budgetary forecasts. Difficult decisions have been made, hiring has been frozen in many departments, the workforce has been reduced via attrition and City employees and staff are doing more with much less. The one overarching concern that has literally “blown a hole” in the otherwise responsible and successful budget, is the Water Department’s average $1.2 - $2 million of yearly losses. This is a complicated issue, as every story has two sides. The City Administration and Council as a whole has made decisions based on the best information and guidance from professionals that we had at that time. 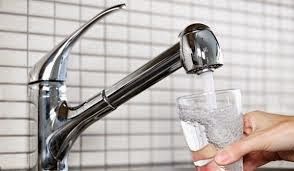 Unfortunately, important information, such as the degree of disrepair the city’s underground water pipes are currently in, was unknown and the recommendations of staff, were at times, woefully off due to that same lack of knowledge as to the true causes of the Water systems insolvency. For me however, I campaigned on supporting a Regional approach to maintain quality of City services while being more efficient. Over the last 4 years of my time on Council, I have been a proponent of regionalizing our Water Department and Sewer System, Police & Fire Dispatch, CHPD SWAT Team, joining the E.D.G.E. communities and joining the Shaker & University Heights Fire Department merger study, amongst others. I believe that due to shrinking City budgets and a smaller population than 50 years ago, the status quo can not and should not be continued. It is becoming more burdensome every year. For me, regionalism is neither scary nor bold change. To me, regionalism is simply, the responsible way to ensure a better and brighter future for Cleveland Heights. 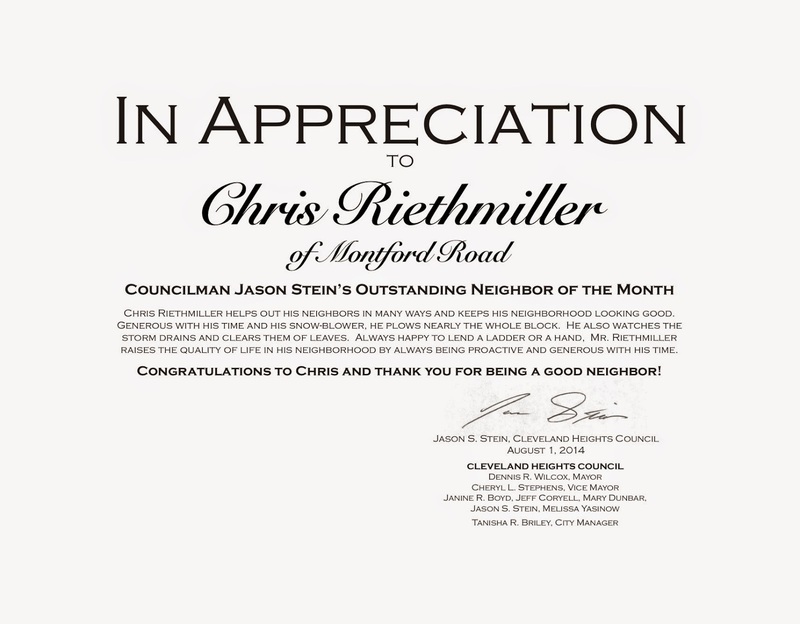 Councilman Stein’s Outstanding Neighbor of the Month Award for August 2014 goes to Chris Riethmiller of Montford Road. If you would like to nominate a neighbor for Councilman Stein’s Outstanding Neighbor of the Month award, please visit http://councilmanstein.blogspot.com/ and fill out the online form or you can email me at jstein@clvhts.com and request a paper form that you can complete and return to me. The region has seen an increase in juvenile crime. The CHPD is working hard to keep our neighborhoods safe. Over the last three years alone, we have initiated the Neighborhood Watch Program, Meet you Police every Thursday from 6:00-8:00PM at City Hall, created the Community Response Unit, a bicycle patrol unit, a facebook and twitter presence and many more initiatives. In our ongoing efforts to make Cleveland Heights the safest inner ring suburb in the County, we have now created a juvenile diversion/mentoring program. This program will give at-risk youths the opportunity to change their path from the "wrong road" to a life of positive opportunity. Click on the 60 second video to hear my public comments on this new program. Have you ever wondered how Cleveland Heights spends your tax dollars? Maybe you are curious to know how much tax revenue the city collected last year. Whatever your tax revenue questions may be; now, you can find the answer online. “Cleveland Heights has become the first city in Ohio to offer an interactive online reporting tool that allows residents, elected officials and City staff to explore the City’s financial data in real time.” Cleveland Heights is bringing transparency, understanding and analysis of the City’s annual budget and monthly expenditures to a new level. My goal is to ensure that you are heard and considered, and as frequent as possible, that you are satisfied with the results.